Ion Ţiriac, a former Romanian tennis player and agent of the tennis champion Boris Becker, is claimed to have remarked: “I have learned to defend myself in every language. To say, ‘I am innocent.’” It was most likely said in jest, but I suspect there was also a smidgen of truth in it. I make it a point to learn a few words and phrases in the native tongues of any country I am visiting. I am innocent is not one of them; I go with I am sorry instead (Îmi pare rău, Ion.) The primary reason to learn a few words and phrases is a matter of courtesy. It shows you are respectful of the locals in the country you are visiting and of their language. Being polite through language (as well as action) also helps foster a positive connection with people. I will add to the different languages as I meet more native language speakers and capture this information. This posting is, of course, written in English and geared toward a native English speaker who is not familiar with the foreign language to be spoken. I recommend learning the following ten words and phrases. My selection criteria focuses on politeness (being respectful and considerate to others) and simple questions or answers. Being able to actually conduct a conversation is not the purpose since you do not know the language. To ask someone "How are you doing?" only to receive a response in a language you do not understand would not be helpful. Say it whenever you meet someone. Say it whenever someone helps you. Say it when departing as a substitute for goodbye because any person you have spoken with is likely to have helped you in some way. Say it whenever someone offers to help you. You can use this word in conjunction with thank you and yes. Yes Answer a yes/no question. Follow it with please if appropriate. Say it even if the question you are responding to was asked in English. No Answer a yes/no question. Follow it with thank you if appropriate. Say it even if the question you are responding to was asked in English. Say it when you sense you may have done something wrong or inappropriate or feel an apology is appropriate. Say it before interrupting someone or doing anything that may potentially be considered inappropriate. Where is the bathroom (toilet)? Get an answer to this important question. This can be shortened to just Toilet? if the rest of the phrase is to difficult to learn. Precede with please or excuse me if approaching someone to ask. If the person responds in words and not by pointing in the direction of a toilet, follow with I am sorry, I do not understand and then with do you speak English? Once you learn the answer, end with thank you before leaving. I do not understand Politeness. Say it when you do not understand. Precede it with I am sorry and follow it with do you speak English? Do you speak English? Get answers beyond your knowledge of the local language. Say it when you need to carry on a conversation beyond the nine phrases above. Use the phrase excuse me or I am sorry, I do not understand before asking this question. It informs the local person that you do not speak the local language or have a grasp of the language. There is also an additional element of politeness because you have asked this question in their local tongue and not in English. This is my own list of "must know" words and phrases. You may ask why I have omitted certain words or phrases that are typical in introductory foreign language courses. Here is my reasoning. The list should be manageable. Ten phrases is just above the "7 plus or minus 2" rule of what is manageable for people to remember. So while goodbye is a good word to use and learn, thank you can substitute well in most situations. The purpose is not to carry on a conversation. To be able to ask how someone is doing (how are you?) or ask their name (what is your name?) is beneficial if you have a large enough vocabulary to understand the response and to carry on a conversation. But that is not the purpose of this list. Certain words may be best said in your own language. For example, Help! would be a good word to learn. But panic usually accompanies the need for this word and a seldom-used word escapes memory in times of crisis. It is best to yell and scream to get attention or scream Help! The key is to practice before you arrive in the country and apply what you have learned the moment you arrive. Say each word or phrase whenever you can and whenever it is appropriate. Do not be shy or self-conscious. It is not uncommon for people to feel uneasy speaking foreign words for fear of getting it wrong. Don't worry. You will sound like a foreigner and you will get it wrong at times. But it is the thought that counts. And as far as I know, none of the words contained below will be interpreted as "I want to marry your mother" if you pronounce it slightly wrong. As noted, several of these words and phrases can be used together. For example, it helps to combine words of politeness with the questioning and answering words. If there are multiple ways of saying something, go with the recommended suggestion by native speakers on what is most appropriate. If you cannot find that out, go with the formal rather than the informal. Some countries or regions within a country may have their own vernacular. If it is possible, learn the specific words and phases of the country or region you are visiting. The words may be different or have a different connotation between countries even though the language is the same. French French and Canadian French are slightly different. You could write these words down on paper or use a phrasebook and point to the word or phase. 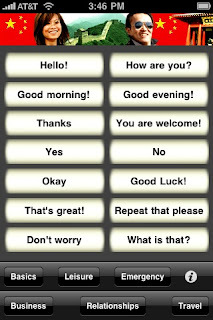 In addition, there are some good smartphone applications available with several written and spoken words and phrases. For example, the iPhone has a free Talk Chinese app (see below) with several basic words and phrases spoken in Mandarin. Touch a word or phrase and you can hear it spoken in Chinese by a native speaker. I still recommend you learn and speak the ten words and phrases in your own voice. But these types of tools can come in handy if the language is too difficult to pronounce or the person you want to communicate with does not know any English. You are still showing interest in their language and being polite. Many countries have more than one language spoken. Keep that in mind as you travel. You may need to learn more than one language depending on the region of the country you will be visiting. And by all means learn more words and phrases or become proficient if that is your interest. This list is intended to be the minimum you should learn. The tables below list the ten words in several different languages. NOTE: This is a work in progress. I will update as I get translations, confirmations, and help with pronunciation. There are over 6900 languages currently spoken in the world according to the 2009 edition of the Ethnologue. I have chosen to include at least the top ten languages based on the number of native speakers of that language (except for Bengali and Javanese until I find translations) and a few others of interest to me. You, of course, will be interested in the language(s) of the place you are going. If it is not listed below, search on the internet for an English dictionary in that language. You can also use a tool like Google Translate to look up the words and phrases. Just check the answer with a native speaker before or on arrival to confirm the translations. Where is the bathroom? Wèishēngjiān zài nǎlǐ? Do you speak English? Nǐ huì jiǎng yīngyǔ ma? Where is the bathroom? ¿dónde está el baño? DOHN-​deh ehss-​TAH ehl BAH-​nyoh? Do you speak English? ¿Habla usted Inglés? AH-​blah oos-​TEHD een-​GLEHSS? Where is the bathroom? Snānaghara kahām̐ hai? Do you speak English? Kyā āpa aṅgrēzī bōlatē haiṁ? क्या आप अंग्रेज़ी बोलते हैं? Do you speak English? Hal tetakallem al-​inglizia? Shukran to the woman at the Persian restaurant. Where is the bathroom? Onde é o banheiro? OND-​de eh o bahn-​YAIR-​row? Do you speak English? Você fala Inglês? fah-​lah ing-​GLEZH? Eigo o hanase masu ka? Ở đâu là phòng tắm? Bạn có nói được tiếng Anh? Note: Males should also say krap, and females ka, at the end of each of these words and phrases to be polite. If you have information on another language that you would like added to this list, please use the Feedback page. You may also send an e-mail to daniel at danielsklar.com . Below is the information you can provide. If you are a native speaker, adding a sound file where you pronounce the words would be a bonus, and I will add it to the information.